Year in year out, the Malaysian sports fraternity make New Year resolutions and vow to take the level of sports to the next level. But at the year end, we’re just faced with more disappointments than reasons to celebrate. After each disastrous outings there is a big hue and cry and promises with promises made to make things better. But have we really mastered anything at all? Every year we find inept and good-time officials being the root cause of much of the disappointments. In 2014, Malaysian outings at two major games – the Commonwealth Games in Glasgow and Asian Games in Incheon – were disastrous. After the London Games in 2012, there was talk of being better prepared. The XXXI Olympic Summer Games 2016 is from 5th to 21st August 2016 in Rio de Janeiro, Brazil – seven months away. The much talked about Podium programme for the Games which was supposed to be launched last year is still not in place. It is learnt that it will finally launched later this month. How much can be done in a short time to be fully prepared for the challenge ahead is left to be seen. 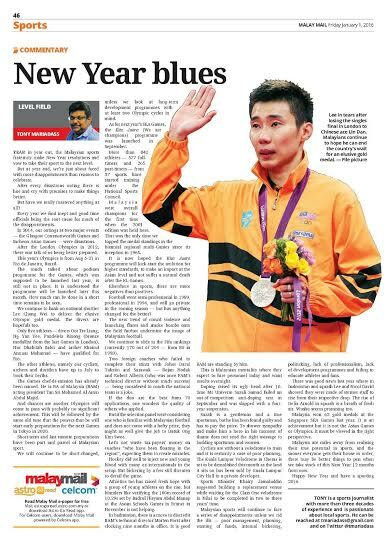 We will continue to bank on national shuttler Lee Chong Wei to deliver the elusive Olympic gold medal. The divers are hopefuls too. Only five athletes – divers Ooi Tze Liang, Ng Yan Yee, Pandelea Rinong (bronze medallist last Games) and Nur Dhabitah Sabri and archer Khairul Annuar Mohamad – have qualified for Rio. Two golfers are said to have qualified by Olympic Council of Malaysia has not made any official announcements yet. The other athletes, namely our cyclists, archers and badminton players have up to July to book their berths. But the chef-de-mission for the Games has already been named in Deputy President of Badminton Association of Malaysia (BAM), Tan Sri Dr. Ir. Mohamed Al Amin Abdul Majid. And chances are another Olympics will come and pass with probably no significant achievement. This will be followed by the same old tune that the powers-that-be will start early preparations for the next Games in 2020 in Tokyo. Short term and last minute preparations have been part and parcel of Malaysian sport. We will continue to be short-changed unless we look at long term development programmes with at least two Olympic cycle in mind. As for next year’s Sea Games which Malaysia is hosting, the Kita Juara Kita (We are champions) programme was been launched in September. More than 842 athletes - 577 full-timers and 265 part-timers – from 37 sports have started training for the Games under the National Sports Council. Malaysia emerged overall SEA Games champions for the first time when the 2001 edition was held here. That was the only time Malaysia had topped the medal standings in the biennial regional multi-Games since its inception in 1965. It is hoped that this programme will kick start the ambition to aspire for higher standards, for starters to make an impact at the Asian level and not suffer a natural death after the 2017 KL Games. Elsewhere in sports, there is more negativity than positiveness bogging Malaysian sports. Football went semi-professional in 1989, professional in 1994, and next season the league is going to be privatised – but has anything changed for the better? The new trend of crowd violence, firing of flares and smoke bombs onto pitch is further destroying the image of Malaysian football. That two foreign coaches who failed to complete their stints with Johor DT and Sarawak respectively state level – Bojan Hodak and Rober Alberts (who had a stint as FAM’s technical director without much success but bringing down Malaysia’s ranking) are in consideration for national coaching job must be a joke. If the two are the best from 70 candidates applied, one wonders what the quality of the coaches who applied was. But if the selection panel were considering familiarity of Malaysian football and affordable wages, they might itself give the job to Datuk Ong Kim Swee. If we are going to compromise on wages and settle for lesser coaches, it does not speak well of the ambitions to aim high. If we cannot afford the best and hope that some miracle can happen with coaches “who have been floating in this region’ let us not waste the tax payer’s money. Hockey had done well to inject new and young blood with my ex-internationals in the set-up and doing some good job to see the game rise again. But there is still some bickering and agendas by a few which is threatening to derail the game. 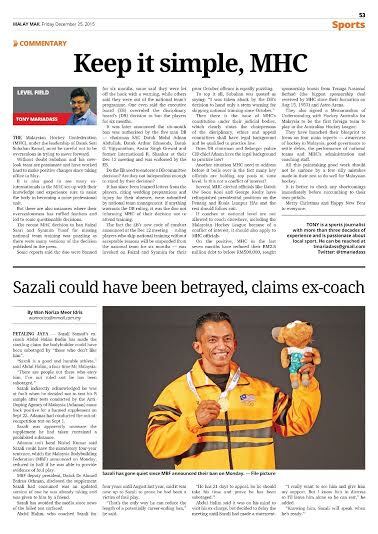 Athletics too has given some fresh hope with a young set of athletes on the rise, but blunders like verifying the new 100m record of 10.29 set Badrul Hisyam Abdul Manap ‘set’ at the 7th Asean Schools Games in Brunei is not helping the sports one bit. There is also personality clashes which is bogging the sports. In badminton, there is already move to discredit Badminton Association of Malaysia’s technical director Morten Forst after he has been here only for nine months. It is good that BAM have come forward to say that they stand by him. This is Malaysian mentality where they expect to hire personnel today and want results overnight. Doping has marred its ugly head with ten-time Mr Universe, Sazali Samad failing an out-of-competition doping test in September and has been slapped with a four year suspension. Sazali is perfect gentlemen and a great sportsman, but he has been found guilty and has to pay the price. But to shower sympathy and make him a hero in his moment of shame, certainly does not send the right message to young budding sportsmen and women. Cycling is left without a velodrome to train and it is certainly a case of poor planning. The Kuala Lumpur Velodrome in Cheras is set to be demolished this month as the land it sits on has been sold by Kuala Lumpur City Hall (DBKL) to a private developer. Youth and Sports Minister Khairy Jamaluddin suggested to build a replacement for the Kuala Lumpur Velodrome while waiting for the Class One velodrome in Nilai to be built and completed in two to three years’ time. What about the Velodrome Raykat in Ipoh which is rotting away? Any chance of repairing it or is there politics involved here too? Until and when we can get rid of all these ills from poor management, planning, wasting of funds, internal bickering, politicking, lack of professionalism, lack of development programmes, failing to educate athletes and fans and failing to have at heart of sports above everything else, Malaysian sports is going to continue to face disappointment after disappointment. The Singapore Sea Game achievement where Malaysia won 62 gold medal must applauded but it must underlined it was at the lowest level of Games and it must be viewed in the right perspective. Other sports who have given reason to be optimistic of Malaysian sports include badminton, archery, wushu and diving. Malaysia are miles away from reaching it’s true potential in sports, and the sooner everyone gets their house in order and perform their duties professionally without any abuse of position, funds and management, there may better things to say when we review the year 2016. Happy New Year and have a sporting year. The Malaysian Hockey Confederation (MHC) under the current leadership of Datuk Seri Subahan Kamal have done many rights for Malaysian hockey, but they must be careful not to be overzealous in trying to move forward. Without doubt Subahan is passionate of the game and together with his new-look team, have worked hard in the short time they have been in office (since May) to make many positive changes for the good of Malaysian hockey. It is also good to see many ex-international hockey players in the MHC set-up and it is hoped that with their knowledge and experience sure to assist the body in becoming a more professional unit. In the past, many ex-internationals have been complaining that they have not been given a role to play in sports after their retirement. Hockey probably has the most number of ex-internationals involved in the governance of the game now. But there have been instances in the new-look team where their overzealous approach have stepped on some toes and at times made decisions which can be questioned. For all the good work they have done so far they must be careful not to get trapped because of their own doing. Decisions made must be carefully thought off and discussed, so that there are no loopholes for any criticisms and made in accordance of the constitution and general rules of the respective committees in place. The recent decision by the MHC on forwards Faizal Saari and Mohamed Syamin Yusof for them having gone for AWOL from national training was puzzling because there were several versions of the decision in the press. Subahan had given a press conference on the decision after their Executive Board (EB) meeting, but it was verbal and not from a pre-prepared text. That probably gave to many interpretations with some reports saying the duo were banned for six months, others said they were let off the hook with a stern warning, while others said they were out of the senior national team’s programme and one said that EB overrules the DB decision to ban the players for six month. So what does that mean? Are they allowed to play hockey or only out of the national programme. Then it was said that the recommendation was made by the five-man Disciplinary Committee comprising chairman SAC Datuk Mohd Adnan Abdullah, Datuk Arthur Edmonds, Datuk G. Vijiyanathan, Awtar Singh Grewal and former international R. Shankar at its December 12 meeting which was endorsed by the Executive Board (EB). Does the EC need to endorse the DB committee decision? Are they not independent and their decision stand. Why did a member of the DB had to present their decision to EB? It is learnt that the letters from the two players on their absence citing wedding preparations and injury, was submitted through a national team management team member. If anything warrants the DB decision, it was that the duo did not inform MHC of their decision not to attend national training. As for the wedding preparations and injury, surely the national team management committee could have made a decision. After all, it has been stated that whether Faizal and Syamin will be considered for future assignments after the six-months was the prerogative of MHC technical director, Terry Walsh, and national team head coach Stephen van Huizen. And the fact that the EB’s new ‘Code of Conduct’ decided at their meeting, where players who skip national training without valid reasons will be suspended for six months, was invoked on Faial and Syamin for an offence prior to the decision, is also puzzling. Something amiss here again as there does not seems to be a uniform consensus on the decision made on the two players. Was the fact that a total ban of the two players would mean that their monthly income (sums ranging from RM5,000 to RM15,000) from the teams would be affected, the reason for decision not for a total ban? If so, it should have been stated. Otherwise, the decision will be a precedent for other cases. Then, the fact that the MHC constitution under the judicial bodies which are the disciplinary, ethnics and appeal Committees respectively, clearly states that the chairpersons of the judicial bodies shall have legal background and qualified to practise law, puts the DB committee in question. Does the DB chairman, the Selangor Police CID chief SAC Datuk Mohd Adnan Abdullah, has legal background to practice law? Another situation MHC needs to address before it boils over is the fact that many MHC key officials are holding key posts at the State level. Is this not a conflict of interest? Besides, would it not better if fresh officials are allowed to take over at the State level, as the present officials govern at the national level. Several MHC elected officials like Datuk Ow Soon Kooi and George Koshy have relinquished as presidents at the Penang and Kuala Lumpur HAs and the rest should follow their example. Officials from the State Has holding office in MHC are from Selangor, Terengganu, Negri Sembilan, Kedah and Penang. If coaches at the national level are not allowed to coach anywhere else including the Malaysian Hockey League because of conflict of interest, it should also apply to the officials in MHC. MHC have also signed a MOU with Hockey Australia for Malaysia to be the first foreign team to play in the Australian Hockey League in September. MHC also have launched their blueprint to focus on four main aspects – awareness of hockey in Malaysia, good governance to settle our debts, the national and junior teams’ performances and the administration and coaching staff of MHC. All this painstaking good work should not be done by a few silly mistakes made in their zest to do well for Malaysian hockey. Better to check any shortcomings immediately before they falling into their own pitfalls. Merry Christmas and Happy New Year to everyone. 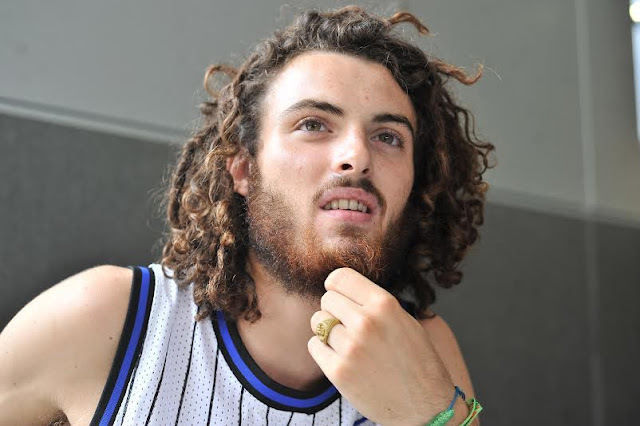 In an age where cheap travel is available through budget airlines which see everyone flying to their holiday destinations, Italian-German youth, Allano Maritano, decided he wanted to travel the conventional way – hitch-hiking. While at worst budget travellers see the world by travelling in a car, motorcycle or bicycle, 19-year-old Allano who just finished his high-school in Berlin, wanted to explore Asia by being in contact with the local people, discovering their culture, eat their food, find secret destinations of the countries he visited and explore each country with a personal touch. “I choose to hitch-hike because I wanted to get up close and personal. 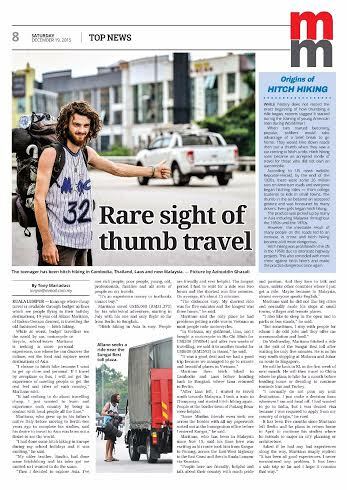 Travelling in an aeroplane or bus, I will not get the experience of meeting people or get the real feel and vibes of each country I visit,” said Allano who began his travel in July from Berlin flying to Bangkok before he started hitch-hiking. “It had nothing to do about travelling cheap. I just wanted learn and experience each country by being in contact with the local people all the time. “I had done some hitch-hiking in Europe earlier during my school holidays and it was exciting. It was then I decided to explore Asia which is so rich in culture and tradition. I meet rich people, poor people, young, old, professionals, families and all sorts of people in my travel and that is a rich experience money or textbooks cannot give,” said Allano whose father his Italian and mother German. “My older brother, Basilio, had done some hitch-hiking earlier and his tales got me excited and wanted to do the same,” said Allano who was brought up in Italy before he moved to Berlin two years ago to continue his studies. Allano said he started saving for his Asia trip in December 2014 by doing odd jobs during his free time and together with some money from his parents and relatives, he left Berlin with US$5,000 (21,270.00). He started of his trip with a very small bag with a shorts pants, two underwear, jacket, two t-shirts, toiletries, a sleeping bag, video recorder (which is broken now) and a hand phone and the clothes he was wearing. But has since bought a haversack, a hammock, a small tent and t-shirts and new underwear. He also carries some food with him now. His German girlfriend, Lina Liebesvoller, too was hitch-hiking and had left earlier to New Zealand to do her hitch-hiking there. Allano met up with Lina who flew to Bangkok from New Zealand to begin his first part of hitch-hiking. “We met in Bangkok and hitch-hiked in Thailand for close to a month before we headed to Cambodia where we spend two weeks before heading to Vietnam,” said Allano when met in Kuala Lumpur on Wednesday before he heading south to Singapore with stops at Malacca and Johor. 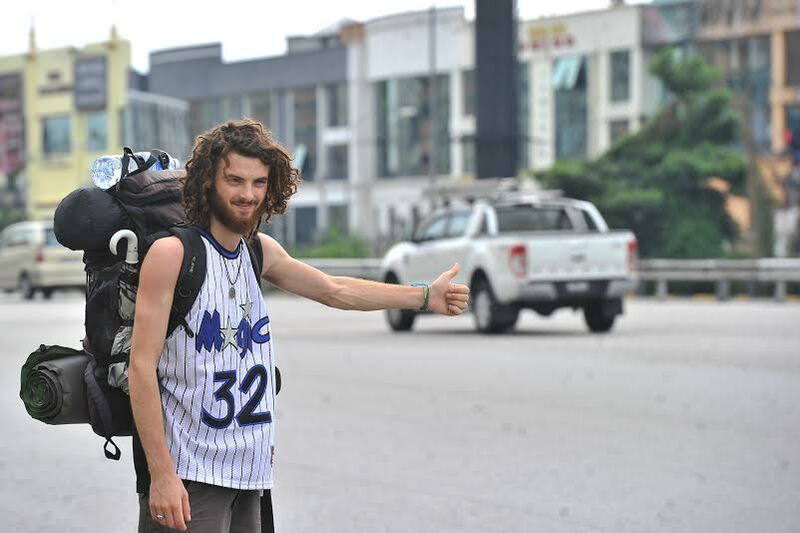 “Hitch-hiking in Asia is easy. People are friendly and ever helpful. The longest period I had to wait for a ride was two hours and the shortest five minutes. But normally at an average of 15 minutes I get a ride. Allano said that the only place he had problems getting a ride was in Vietnam as most of them rode motorcycles. Allano then headed to Cambodia and Laos before heading back to Bangkok – all the hitch-hiking – before Lina left for home as she had her resume her studies. “After Lina left, I started to travel south of Thailand heading towards Malaysia. I took a train to Champong and started my hitch-hiking again. People at the border town of Padang Besar were so helpful. Some Muslim friends I met, even took me across the border with all my paperwork sorted out at the immigration before I entered Kangar,” said Allano who has been in Malaysia since Nov 15. Allano said that the three weeks in Malaysia have been the best. Allano said that in Thailand, most of his rides were on pick-up trucks where he sat behind in the ‘carry-bay’. “I mostly had men giving me rides and sometime families. I have also had those who offered me rides giving me money to take buses. But I refused because I want to explore each country hitch-hiking. Sometimes, they just thrust the money in my hand for food. “In Malaysia they are even friendlier. They take me to their homes for a meal or buy me meals. Show me interesting sights. Explain to me each spot during the ride. Bring to me to hidden secret places. It has been very exciting and thrilling,” said Allano who came down from Kangar to Penang before taking the East-West highway to the East Coast and then heading down to Kuala Lumpur via Kuantan. Allano said he does not like big cities and normally makes his stops at small towns, villages and remote places or interesting places. “I also like to sleep in the open and sleep in parks, bus stands or an open areas. Allano said that a website called Helpx which has places in almost every country which has people or organisations advertising their places for odd jobs and accommodation. “I worked a helper in a farm in Penang and in Pound Pub in Mutiara Damansara when in Malaysia,” said Allano. At Pound he started off as a waiter before he was deejaying. 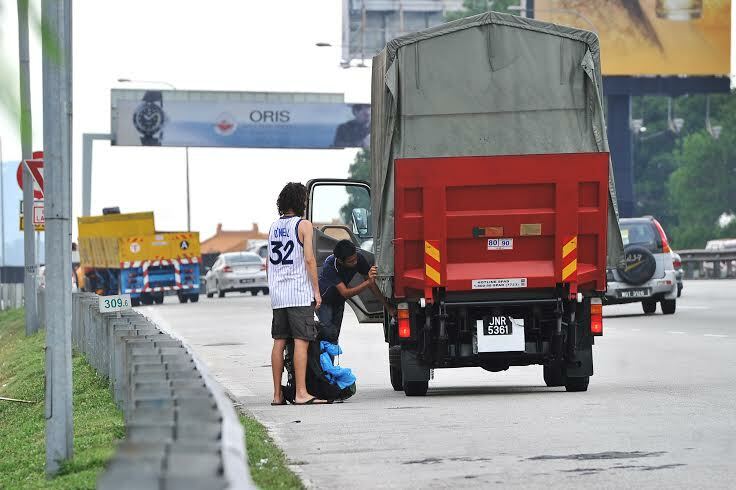 On Wednesday, Allano hitched a ride after only waiting for five minutes standing after the Sungei Besi toll. 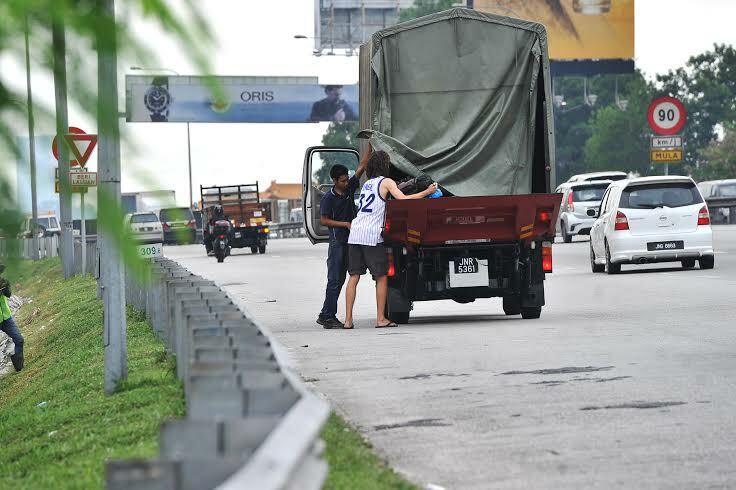 A five-ton lorry stopped and the attendant even came out to open the canvas wrapped around the lorry to assist Allano place his haversack before he got into the small lorry and went off. He will be back in Kuala Lumpur on the first week of January to catch his flight to China – his next destination – where he plans to hike around for a month before deciding to go home or continue heading towards Iran and Turkey. It has been five months since he left home and plans to return before April to continue his studies where he intends to major in city planning or architecture. 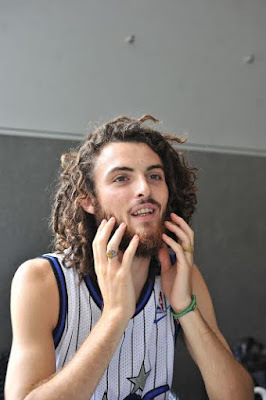 Allano who started his journey with a light beard and short hair, now spots a heavy beard and dreadlocks. “I have not shaved or cut my hair since I started my trip. I just trim my beard a little if it gets untidy. I had my hair in locks when it grow long,” laughed Allano. “I am going to keep this beard even when I return home to remind me of the experience of my trip. Besides, it means me a character. Said Allano with a wide smile. Allano has certainly proved that the traditionally way of seeing the world by hitch-hiking is still very much alive and it is still safe and fun. Veteran journalist Tony Francis commands respect and admiration from all sections of the media and the sporting fraternity, about whom he wrote with rare felicity. 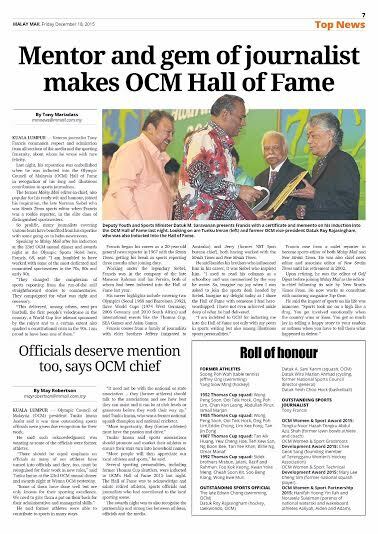 Last night his reputation was embellished when he was was inducted into the Olympic Council of Malaysia(OCM) Hall of Fame in recognition of his long and illustrious contribution to sports journalism. 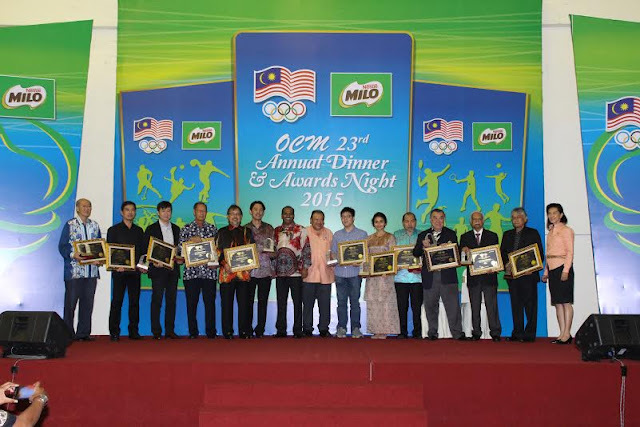 The award was presented by deputy sports minister Datuk M. Saravanan at the 23rd OCM Annual dinner and awards night at the Tan Sri Hamzah Arena at the OCM Sports Complex in Kuala Lumpur. The former Malay Mail editor-in-chief, also popular for his ready wit and humour, joined his inspiration, the late Norman Siebel who was Straits Times sports editor when Francis was a rookie reporter, in the elite class of distinguished sportswriters. So prolific, many journalists covering various beats who have benefited from his expertise with some going on to helm newsrooms. Speaking to Malay Mail after his induction, Francis 68, said: " I am humbled to have worked with some of the most dedicated and committed sportswriters in the 70s, 80s and early 90s. “They changed the complexion of sports reporting, from the run­-of-­the mill straight forward news stories to commentaries. They campaigned for what was right and necessary. Francis began his career as a 20-year-old general news reporter in 1967 with Straits Times, getting his break in sports three months after joining duty. Working under the late legendary sports writer Normal Sibel, Tony had the company of the late Mansoor Rahman and Ian Pereira as colleagues, both of whom were among the first sportswriters to be inducted to the Hall of Fame last year. His career highlights include covering two Olympics (Korea 1988 and Barcelona 1992) and three World Cups (1974 Germany, 2006 Berlin and 2010 South Africa) besides a host of international events like the Thomas Cup, Sea Games and Asian Games. Tony Francis comes from a family of journalists -Tony’s elder brothers Jeffery (migrated to Australia) and Jerry (former NST Ipoh bureau chief), were both working with New Straits Times. He said besides his brothers who influenced him in his career, it was Siebel who inspired him. “I used to read his columns as a schoolboy and was mesmerised by the way he wrote. “Imagine my joy when I was asked to join the sports desk and Norman was the sports editor and today I going to share the same Hall of Fame with whom I had admired and hero worshiped. I had not even achieved ankle deep of what he had achieved. Francis rose from a cadet reporter to become Assistant Sports Editor, Sports editor, Chief News Editor and Associate Editor before he retired from New Straits Times in 2002. Upon retiring from NST, he was the Editor of Golf Digest with Blu Inc before joining Malay Mail under its new management as the editor-in-chief following its sale by New Straits Times Press. He now works as a consultant with motoring magazine Top Gear. He said the impact of sports on his life was immense. “Sports took me on a high like a drug. You get involved emotionally when the country wins or loses. You get so much joy in telling a happy story to your readers or sad when you have to tell them what happened in defeat." Francis not only made a name for himself as sports journalist and as an editorial man, but has been a mentor for many young reporters including the scribe. Malaysia want to move forward in football to pull themselves out of the doldrums, but as long as strange decisions are made by the authorities of the game, it could well be a dashed dream. Several decisions made, or going to be made, in the football circles at national and state levels make one wonder if Malaysia are headed in the right direction. For starters is the Football Association of Malaysia’s (FAM) decision to hire former Estonia youth coach Frank Bernhardt instead of the favourite – national interim coach Datuk Ong Kim Swee. While we respect the decision of the interview panel – comprising three representatives from the FAM technical committee and the National Sports Council who were thorough and obviously impressed by the German – giving him a two-year contract and a key performance indicator (KPI) to win the 2017 SEA Games gold medal does not seem right. Do we need a foreign coach to steer the team towards a SEA Games gold when Datuk K. Rajagobal and Ong had already done it in 2009 and 2011 respectively? If it was Bernhardt’s expertise in youth development that impressed FAM, they should have given him a longer contract – at least four years – to lay the foundations for a strong supply of fresh players for the national team. With a two-year-contract, Bernhardt’s contribution will be limited and he is only going to concentrate on winning the SEA Games gold medal and will not or have the time to work on a wider scale. The 46-year-old starts work in January and although it was reported that he does not have a team to work with because FAM had disbanded the Harimau Muda A, B and C squads and most of the players had signed contracts with their state sides for the M-League next season, his first job will be probably to identify Under-21 players for his squad. This is because the Asean Football Federation (AFF) has proposed to the South-East Asian Games Federation (SEAGF) that the 2017 Kuala Lumpur SEA Games Under-23 football competition be made an Under-21 tournament. SEAGF is expected to make a final decision on this soon and is expected to adhere to AFF’s recommendation. Coming back to Ong, it will be interesting to see what FAM’s next move will be. The national body is expected to name the national coach by the end of the month and is vetting the 70 odd candidates who had applied for the job, including Ong. The question is whether FAM, after having given the Under-23 job to Bernhardt, will make a compromise and decide to offer the national job to Ong, who has been with the national setup since 2009 when he took charge of the Under-19 squad. One can only wait and see. Other strange football developments include the speculation that Pahang’s coach Zainal Abidin Hassan is all set to coach Selangor next season, especially since Pahang have named their Zainal’s assistant, former international Ahmad Shaharuddin Rosdi, as their new coach. This season’s Selangor coach Mehmet Durakovic, who steered them to their 33rd Malaysia Cup victory last Saturday after a ten-year wait, still has a year left in his contract. So, why remove a winning coach and bring in home-grown Zainal whose team lost to Selangor in the Malaysia Cup semi-finals? It is said that Mehmet will be made the technical director. Mehmet’s assistant, former Selangor player P. Maniam – loyal and faithful to the state and even a caretaker coach – looks to be booted out. 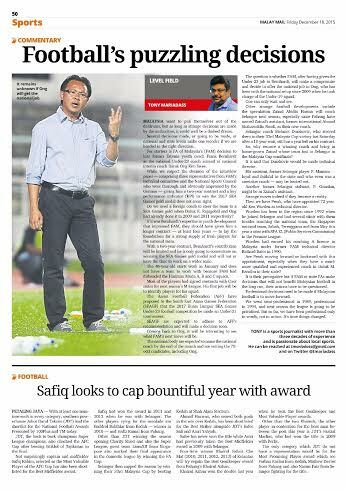 Another former Selangor stalwart, P. Gunalan, is set to join the state as Zainal’s assistant. Strange moves indeed if they become a reality. Then we have Perak, who have appointed 72-year-old Ken Worden as their technical director. Worden has been in the region since 1992 when he joined Selangor and had several stints with them besides coaching the national team, the Singapore national team, Sabah, Terengganu and from May this year a stint with SPA KL (Public Services Commission) in the Premier League. Worden had earned his coaching A licence in Malaysia under former FAM technical director Richard Bates in 1990. Are Perak moving forward or backward with the appointment of Worden, especially when they have a much more qualified and experienced coach in Datuk M. Karathu in their state? It is their prerogative, true, but if FAM or the state FAs make decisions that will not benefit Malaysian football in the long run, their actions have to be questioned. Professional decisions need to be made with football at heart if Malaysian football is to move forward. We went semi-professional in 1989, professional in 1994, and next season the league is going to be privatised. But so far, we have been professional only in words, not in action. It’s time things changed.